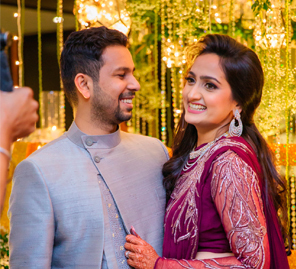 With themes inspired by Indian Royalty and Sufi mysticism, Binneey and Dhanesh's wedding in Thailand gave their guests many unique experiences. 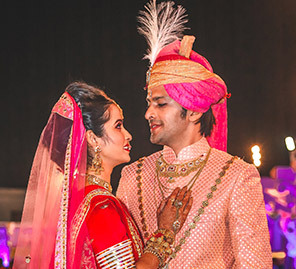 Binneey and Dhanesh planned their lavish wedding celebrations in Thailand at The Palayana Hua Hin with events that ranged from a pool party to a royalty-inspired wedding and a Sufi night. Take a peek into their nuptials. The guests woke up to the celebrations with a glorious pool party to which everyone came dressed in chic clothing and danced all day to good music. The bride was dressed in a glamorous blue gown and Dhanesh wore a simple white t-shirt and blue shorts. Blue and white ruled their beachside pool party with quirky decor elements to add charm. The mehndi ceremony was an intimate affair with only close family and friends in attendance. 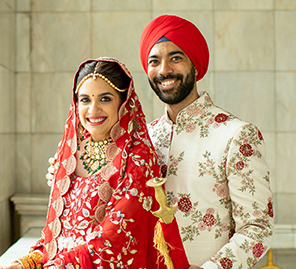 A simple yet colorful setup was created with fresh flowers, traditional marigolds and dozens of bright decor elements turning everything celebratory, desi style. To add to the flavor, the refreshment corner was done up like a truck, dishing out ice-cold drinks as people grooved to the music. Held in the beautiful ballroom of the property, the ring ceremony kicked off with a dance performance by the groom and his boys. The couple had planned the entire event to reflect the grandeur of royalty in a modern context. After the ring ceremony, the party had the entire crowd dancing away into the wee hours! For the Sufi night, the décor was planned with a Sufi theme. The venue was lit up with bright lights that illuminated the beautifully designed dance floor. Rich fabrics like velvet with lamps were used in abundance. The cuisine featured robust flavors and mouth-watering delicacies along with some cocktails. The pink floral mandap constructed by the seaside was the scenic highlight of this event. As the sun set, Binneey walked down a flower-strewn path surrounded by her closest family and friends into the next chapter of her life. The ceremony itself was a beautiful blend of wedding customs, with the pheras playing a central role. Decorated with gold accents and elements, with a roomful of guests dressed in their classiest outfits, the reception was a beautiful close to a fantastic celebration. 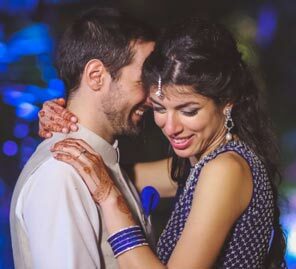 Traditional and modern elements, friends and family, Indian and Western, everything blended into one glorious celebration filled with love and laughter for all.